One of the new trucks brought in by Higgins in a bid to improve its traffic management equipment. Higgins has finished the major construction work on the four lane highway in Nadi, but they have a significant amount of new work coming up in Fiji. To ensure that they continue to provide the same standard of service and, most importantly, the standards of safety that has marked their previous work for both their works and for the travelling public, they are introducing the latest traffic management equipment into Fiji. The first unit has arrived and is already in use on the roads here, a purpose designed truck that allows fast and safe changes to traffic flow to alter the traffic movement in and around road construction work to meet changing situations as work progresses. It is important that traffic flow control meet the exact needs of the construction taking place and that flow can be quickly altered. Experience has shown that there is potential for traffic accidents where work is taking place and the control of the passing traffic is not tight. The new truck provides exactly that level of control and at the same time protects the Higgins workers who are responsible for that work. Because the management alterations happen in all types of weather and at all times of the day, including in the hours of darkness, the workers are subjected to higher than usual risks. This truck minimises the danger to both the workers and the road users by making the placement of traffic warning signs and direction cones a faster and more visible operation. The truck has a central walk through area that allows the road crew to place material from either side and to do so within the protection of the vehicle. All material required for safe traffic control is carried in closed lockers on the truck and is easy for the crew to access. At the rear of the truck there is a large digital sign that displays instructions to motorists as they approach, indicating which side to pass, speed advisories if needed, and other information. To improve safety, the truck carries light displays to make both the vehicle and the workers clearly visible. 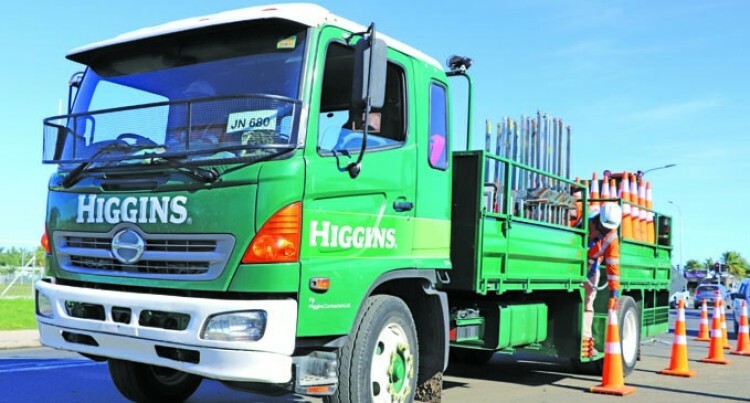 Higgins have a number of other specialised vehicles on the way to boost their construction and maintenance fleets with the latest technology and to ensure that the best possible quality is delivered for Fiji motorists.